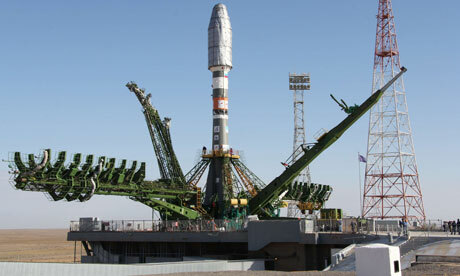 Metop-B launch site in Baikonur, Kazakhstan (Credits: AFP/Getty Images). As the Metop-B weather satellite was going through Launch and Early Orbit Phase (LEOP), more than 100 European experts from industry, academia, and national space agencies gathered at ESOC – ESA’s European Space Operations Centre in Darmstadt, Germany – on 17–18 September to discuss ways to actively remove man-made debris from orbit. The event took place as part of ESA’s new Clean Space initiative, designing novel technologies and approaches for the active removal of targeted objects. With more than 20000 trackable non-operational satellite fragments larger than a cup of coffee in low Earth orbit (LEO) and geostationary orbit (GEO), operating satellites and manned vehicles are increasingly vulnerable to severe destructive collisions. On 10 February 2009, a first-ever in-orbit collision occurred involving a U.S. active communications satellite, Iridium 33, and a Russian defunct military satellite, Cosmos-2251. With a relative velocity of 36000 km/h, the collision generated more than 3000 trackable fragments that spewed into the space environment. “The removal of a large, uncontrolled object is an enormous technological challenge – but by removing on the order of five to 10 such objects per year, it would be possible to control debris growth while normal spacecraft activities could be continued,” Reiter added. Debris levels in LEO have increased by 50% in the last five years, which increases the probability of collisions and requires debris-avoidance maneuvers for the International Space Station crews. On September 25, ESA’s third Automatic Transfer Vehicle (ATV-3) departure from the International Space Station (ISS) was further delayed as a result of a potential collision risk involving a couple of passing fragments and the Station. The robotic cargo ship finally undocked from the Station on September 28, three days behind its original date. Workshop participants recognized there is no “magic solution” to reduce all types of orbital space debris. But they remain hopeful that continuous technical studies on multiple fronts will result in a finalized prototype mission blue print for retrieval of decommissioned objects by 2015. That’s when ESA’s ATV-5 mission is scheduled to fly. It will include experimental optical sensors that could be used for future rendezvous with ‘uncooperative targets’ like ESA’s stranded Envisat satellite. ESA’s Automated Transfer Vehicle (ATV) has performed three successful rendezvous with the International Space Station, docking to the Station’s Russian service module Zvezda and achieving controlled Earth reentries with unprecedented precision. Reiter emphasized that European industry valuable know how on ATV technologies and its successes provide a credible foundation for designing dedicated removal missions.